I developed these hubs as a solution to recurring problems with the wheels coming off my 12lb Robot "Surgical Strike". 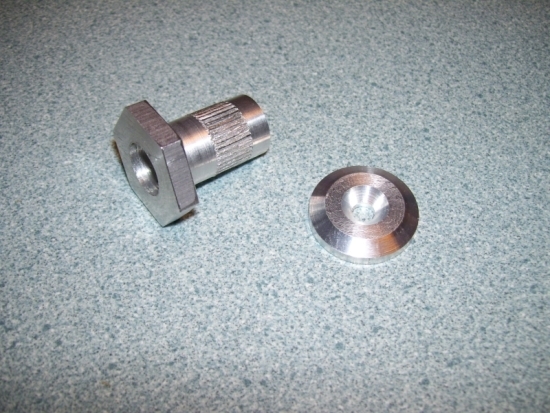 A 1" hex flange performs two functions. Firstly it stops the wheel sliding inwards off the hub. The second function is to allow the use of a 1" wrench to help remove the hubs from the gearbox axle. The straight knurl on the surface of the hub prevents the wheel spinning on the hub. The hubs we used before had plain surfaces and the wheels would loosen up over time. Finally a large custom washer is used together with the usual left hand thread screws that come with the drills. This prevents the wheel sliding outwards off the hub. Servo Magazine article about how to make them if you were so inclined. 3D IGS file of the hub. We recommend the use of an anti-seize grease on the thread of the motor and Loctite thread locking compound on the securing screw.